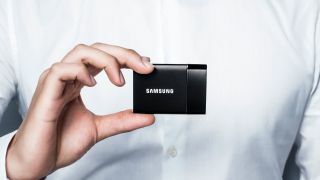 Portable hard drives can be frustratingly unreliable beasts, so Samsung is hoping you'll channel that frustration into forking out for its slick, but pricey, new Portable SSD T1. Weighing in at just 30g, the T1 is about as far from the comparatively chunky, cumbersome hard drives we're used to as you can get. Available in Australia from today in 250GB, 500GB, and 1TB capacities, the drive's slim build means that once you slip it in your pocket you probably won't even notice it's there. The T1 will lighten your pocket in other ways, too. Prices range from $269 for the 250GB model, $429 for 500GB model, and a whopping $799 for the 1TB. With a 1TB hard drive costing a tenth of that, you really are paying for the T1's admittedly cool Red Dot Award-winning design. Being an SSD, the drive's lack of moving parts should help to keep it from crashing (we've all been there), while your data should remain secure (provided you choose your password carefully) thanks to its AES 256 bit encryption algorithm. Capable of read/write speeds up to 450 megabytes per second, the T1 has speed to match it's looks, but while this may be the Ferrari of SSD drives, sometimes a good ol' Hyundai is inarguably better value. Pricing aside, though, it's hard not to be impressed by such a slick little piece of kit. Interested in what else Samsung has been up to? Check out its latest flagship smartphone via our Galaxy S6 review.